Put Cream Cheese and Sugar in a mixing bowl and mix until creamy. Add 1/2 cup of Milk to Cream Cheese and continue to mix. Add Cool Whip to Cream Cheese mixture, mix until smooth and creamy. 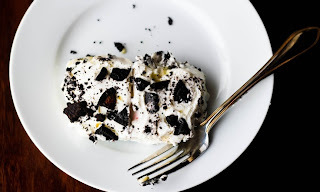 Pour (or) spoon 1/2 of Cream Cheese mixture over Oreos, and spread carefully. Refrigerate 30 minutes. Remove from fridge and top with remaining Cream Cheese mixture, sprinkle reserved Oreos over the top and return to fridge until serving time. wow... looks so yum... loaded with calories!!! Looks super delicious dear, thanks for stopping by my space. Will be happy if you follow me back as well. Thank you Priya, so glad to follow you..
Oh Gosh! 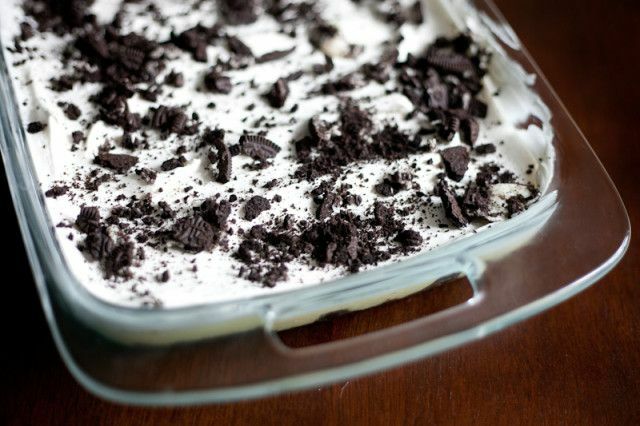 super yummy dessert made with oreo cookies. Simply delicious!!! Thanks for dropping by my space and leaving your lovely words there. Keep in touch. Thank you Sanoli...following you, will be happy if you follow me back. This is one of my easy to go potluck dessert. Isn't it a life saver?